We can train them, but how can we retain them? To the Editor: The Department of Surgery at the Nelson R Mandela School of Medicine is proud of its 100% pass rate in the October 2008 Colleges of Medicine of South Africa examinations held in Durban. 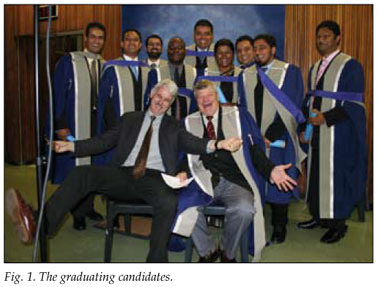 Most candidates attended the graduation and joined the 3 who passed in May as registered specialists in general surgery. This represents a stalwart effort on the part of the candidates and their tutors, the consultants in the department. Professor Robbs, in his retirement year, was justly proud of this achievement and honoured that our candidates asked him to robe them at the graduation ceremony. Despite the quality and success of the trainees, only 3 of the 15 have been appointed as consultants in KwaZulu-Natal province, one has left for Witbank, and one is about to leave to take up an appointment in Johannesburg  this despite the fact that the departments of surgery in the province have the posts to employ the majority of them. Unfortunately, although a total of 9 posts are available and have been motivated to be financially unfrozen, no interviews have taken place. This inertia at the provincial administrative level to finance and advertise these posts exists despite a public statement to the contrary. The Medical School has also been ineffectual in influencing the provincial health authorities to fund over one-third of these posts which are on the 'joint medical establishment', i.e. joint university and provincial posts. This impasse surely needs to be addressed so that interventions to institute meaningful dialogues between the province and the Medical School can occur. If no urgent solution to this problem is found these individuals will leave, and at least 3 are actively pursuing an overseas option. Others will head for the already over-manned private sector or to other provinces. Once they leave they are unlikely to return.